When it comes to vacations, not everyone wants to get away from it all. In fact, some very much want the familiar comforts and convenience of a fully functioning home. That’s why, here in Traverse City, many families choose the North Shore Inn. 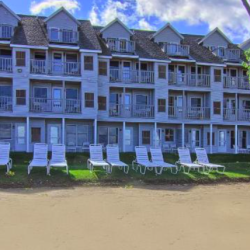 Located on Traverse City’s popular “Miracle Mile”, the Inn is comprised entirely of privately owned condominiums, which are available for rent year-round. Every suite features almost all the comforts of home, including a spacious living room, dining room, one or two bathrooms and bedrooms, a full kitchen—pots, pans, dishes, you get the idea—along with a walkout balcony (or two) to an amazing beachfront view. 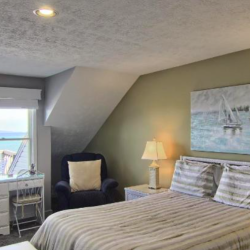 The property has three floors, with the third floor featuring suites that include a master bath and bedroom, along with a secondary bedroom and bath. Scott is quick to point out that both the master bedroom and living room have separate walkout balconies. “It’s a great way to wake up in the morning…you walk out to the sun hovering over the bay. It’s amazing.” The second floor has suites with one bedroom and one bath, with a walkout balcony coming from the living room. 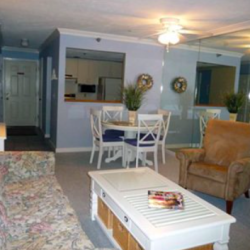 The main floor suites have two bedrooms and one bath, with the walkout balcony also coming from the living room. The property also has complete laundry facilities.